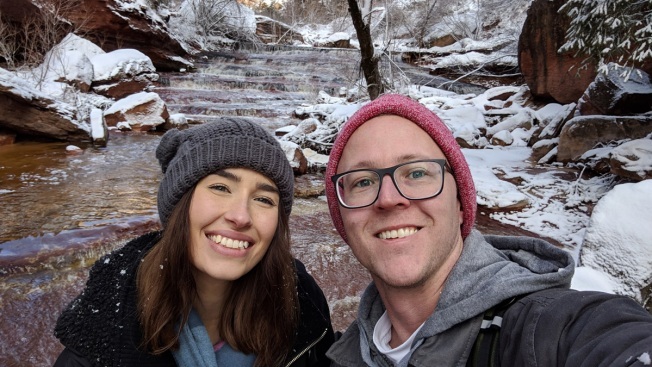 Ryan Osmun takes a selfie with his girlfriend, Jessika McNeill, at Zion National Park on Feb 16. A man hiking in a national park in Utah got stuck in quicksand and stayed trapped until late that night when rangers were able to reach and free him, NBC News reported. The hiker, Ryan Osmun, then remained with rescuers in the park overnight in frigid, snowy weather until visibility was high enough the next afternoon to airlift him to an awaiting ambulance. The 34-year-old hiker, who is from Arizona, was walking a trail Saturday at Zion National Park with a female friend when his leg became stuck in quicksand along the Left Fork of the North Creek, the National Park Service said Monday. "His leg was buried up to his knee and he was unable to free himself," agency officials said in a statement. "He and his companion tried to free his leg and were unsuccessful."